B.S., Special Education, Florida International University, 2003. Johanna Castellon-Vega is a partner at Perez & Rodriguez. Mrs. Castellon-Vega is a leader in Perez & Rodriguez’s commercial litigation, labor and employment and real estate litigation practice groups. 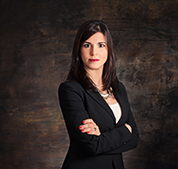 Mrs. Castellon-Vega’s practice includes the representation of banks, creditors, business owners and other corporate clients in matters relating to commercial litigation, real estate litigation, and labor and employment claims. Prior to working at Perez & Rodriguez, P.A., Mrs. Castellon-Vega worked as an Assistant Public Defender at the Miami-Dade County Public Defender’s Office, where she represented indigent clients from the time of arrest to arraignment. Mrs. Castellon-Vega also completed two Certified Legal Internships at the Broward County State Attorney’s Office and at the Pinellas County Public Defender’s Office. Ada Mae Rutledge v. Norwegian Cruise Line, 08-CIV-21412, U.S. District Court, Southern District of Florida. Elof Hansson v. Gerardo Parodi et al., 11-Civ -20495, U.S. District Court, Southern District of Florida. Rodriguez v. Nieves, 75 So. 3d 339 (Fla. 3d DCA 2011). Prior to practicing law, Mrs. Castellon-Vega worked as a special education teacher for emotionally handicapped and severely emotionally disturbed children. Mrs. Castellon-Vega holds both a Bachelor’s and a Master’s degree in education.